The Cellular Scale: How big is the GIANT Squid Giant Axon? How big is the GIANT Squid Giant Axon? Squid are special creatures to neuroscientists. Specifically to neurophysiologists, who study the electrical activity of neurons. Atlantic squid have this huge (1mm) amazing axon running down each side of their mantle which allowed for the first recordings of action potentials in the 1930s. Here is a really nice 5 minute video showing how with (by today's standards) very crude techniques, the electrical signal could be recorded from these axons. So the squid giant axon is neat, and modern neurophysiology would probably not exist with out it. But what about the GIANT squid giant axon? Wouldn't that be an electrophysiologist's dream? 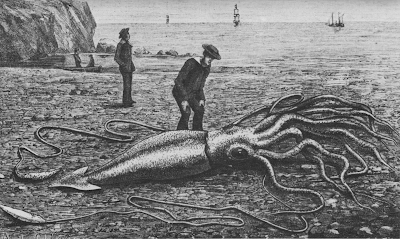 If it scaled proportionally to say, mantle length, the 1foot long Atlantic squid with a 1mm diameter axon would become a 16 foot long GIANT squid with a 16mm giant axon. Let's think about this for a minute, 16mm is about 5/8 of an inch. That is like the diameter of a dime! For those not familiar with US coins, it's like the size of a bead on a necklace... a big bead, like a nice-sized pearl. Basically HUGE considering that most axons in vertebrates are not even visible without a microscope. However,before you all start running out to hunt the giant squid for its precious precious axon...the truth is that the giant squid does not have a super-giant dime-sized axon. The giant squid axon actually has a smaller diameter than the 'normal' squid axon. Surprising right? Do the giant squid just have more axons there, so they don't need one gigantic one? Or is this axon somehow magically myelinated (probably not)? Or does the giant squid just not need one? First, let me explain that this information was pretty hard to come by and basically anecdotal. I watched a few dissections of giant squid. And while these were really amazing (look at the hooks on the colossal squid's tentacles! ), they said very little about the giant axon or how it was modified in these larger animals. “Everyone wants to know whether giant squids have giant giant fibres. We have no material of the central nervous system but some years ago I was able to dissect the stellate ganglion of an animal washed up at Scarborough in 1933 and sent to the British Museum. The mantle length was 125 cm. The nerves of the mantle muscles are arranged in this genus differently from any other I have seen. Those in the front part of the mantle arise from a relatively small stellate ganglion, in the usual way. The hinder part of the mantle, perhaps more than half of the whole, is suspended from a distinct median nerve, running with the fin nerve and giving off a series of branches to the mantle. Young explains that the axon network is set up differently in the giant squid (Architeuthis). He reasons that because the axon is not especially large, it could only conduct so fast, and therefore the fast escape reflex which it causes in the normal squid is just not that fast in the giant squid. This sort of makes sense, in that the giant squid might not benefit from escape as much as the normal squid. 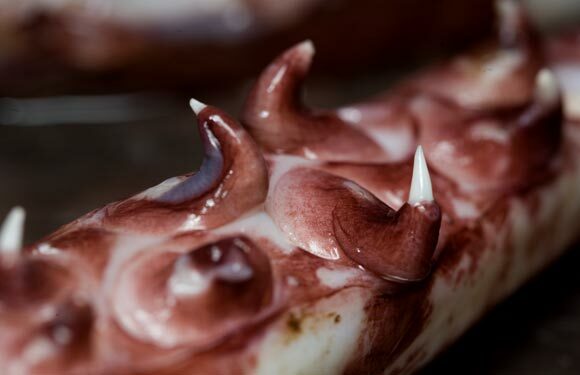 The giant squid might be better served by having razor sharp teeth on its suckers or terrifying pain causing-hooks so it could fight away a predator. And while the first ever video of a giant squid just came out, the first ever photographs from the wild were published in 2005. Header designed by Shirt Art Inc. Does a high fat diet lead to a less 'rewarding' life? Intuition or a sense of Smell? LMAYQ: Why do I like that? Copyright 2012. Simple theme. Theme images by 4x6. Powered by Blogger.